If the weather on our second day of our tour had disappointed then on the third day it was back to the glorious sunshine of the first. There was still a stiff breeze and it was cold, but everything looked wonderful in the sun. And of course the previous day’s rain had washed the air completely clear. The plan was to leave Arran’s west coast and take the small ferry over to Claonaig on the Kintyre peninsula, and doing so meant that the day started with a drive round the north of the island to Lochranza. We had time here to visit the ruined castle and explore the small harbour and anchorage, but it was so windy and cold that after exploring the castle ruins most people headed for the ferry dock about a quarter of a mile away where we found a sheltered spot to drink a takeaway cup of tea from a local stall. Then it was onto the ferry for the short crossing to Claonaig. I went up on deck to get some images but it was very windy and cold out on the open sea. After landing in Claonaig we drove north to Tarbert, a very pretty spot with a sheltered harbour and – yes – yet another ruined castle. (I gather that the west of Scotland was a pretty warlike place in the past.) 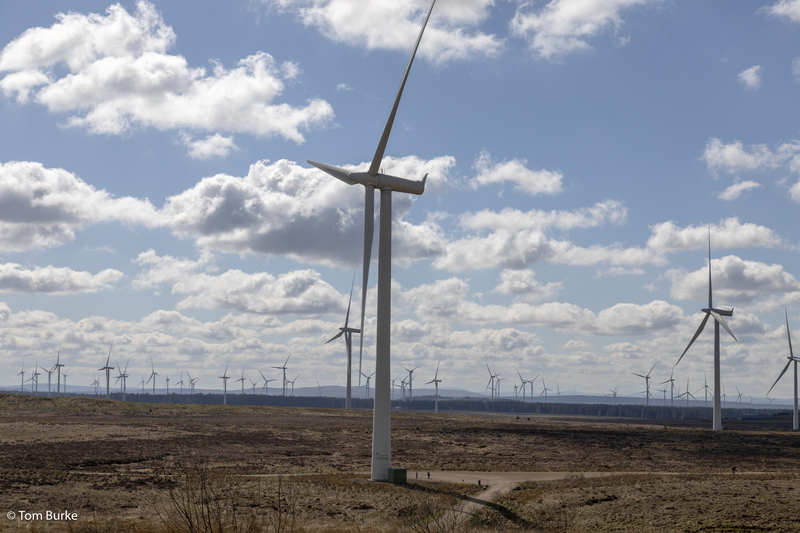 And yes, given that we were on the Kintyre peninsula Pete our tour guide did give us a quick blast of That Song by Wings…. Then it was on again, to Inverary. Once again we had the chance to walk around. We’ve been to Inverary before and had visited the castle (this one being of the stately home variety rather than ruinous). In fact the visit wasn’t very long, but we had time to explore the small town and have some lunch as well. Back in the bus we went onto the next stop – the top of the Rest and Be Thankful pass, which is route from the west side of Argyll to the more south-facing area at the top of Loch Long. 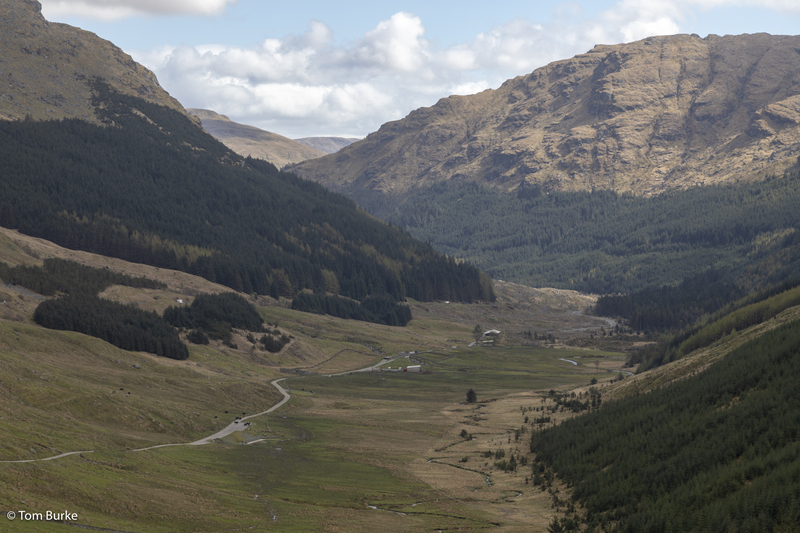 Apparently it was given this name by soldiers in the 18th century who had climbed the steep military road out of Glen Croe and were on their way over to Inverary. This was the end of the climb, and it became the practice for the soldiers to take a break – to truly ‘rest, and be thankful’ that the climb was over. Then there was just one more stop to make. 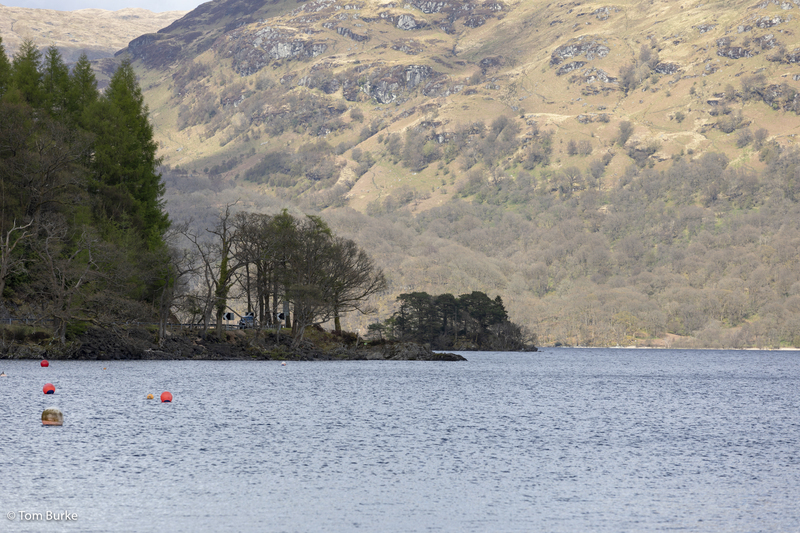 The official itinerary called for a stop at Luss in the central part of Loch Lomond, but Pete suggested a change so we called at the small landing stage at Tarbet, in the northern part of the Loch instead. Again, very pretty and more photos were taken. After that was the drive down the length of Loch Lomond which was over far too quickly. It wasn’t long before we found ourselves on the M8 going past Glasgow airport, and heading into Glasgow to drop Ilona off. Then we headed back to Edinburgh, and we were outside the Rabbies Cafe-bar not long after 6 o’clock. And that was the end of our Rabbies tour to Arran. But our day hadn’t ended…. 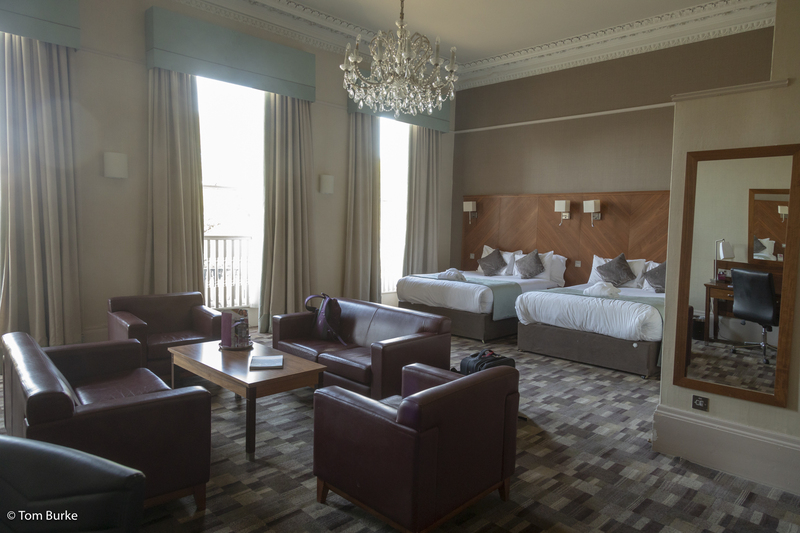 we walked round to the Crowne Plaza hotel, checked in, and found that this time we’d hit the jackpot. We’d been upgraded. I need to explain that this hotel is situated in several houses along Royal Terrace, which was laid out in the 1820s as an eastern extension of Edinburgh New Town – here’s a link to a Wikipedia article about it. Obviously most of the rooms in the houses have been subdivided, but a few – just three, I think – have kept their original full width and full height, and we had one of these for the next two nights. Fantastic! The second day of our tour of Arran with Rabbies dawned a bit differently from day 1 – as you can see above. That’s the view from outside our guest house at breakfast time. However, it was’t actually raining at breakfast time nor when we set off, so the day’s first business was a walk across Machrie Moor to the various standing stones and stone circles. These are reckoned to be at least 3,000 years old, but as usual with these things, no-one has any real idea what their purpose was. One thing is clear, however: given the number and size of the stones (that large standing stone is approaching 4 metres high), this wasn’t the work of one person working on a whim – there must have been an organised effort to create these structures, involving many people and continuing over many years, perhaps generations. So that suggests that there must have been a society, with hierarchies; someone to decide what should be done, how, and with the authority (political? religious?) to get other people to do the work; and many other people to actually do the hauling and digging. Given the thin margin of agricultural surplus that would have been available at that time, I think the society was quite large. Yet we know nothing about them. As we were leaving the rain was starting. We then drove to the southern end of Arran and escaped the rain, reaching Drumadoon Bay near Blackwaterfoot. This was just a wide, wind-swept beach – quite evocative in the gathering gloom. 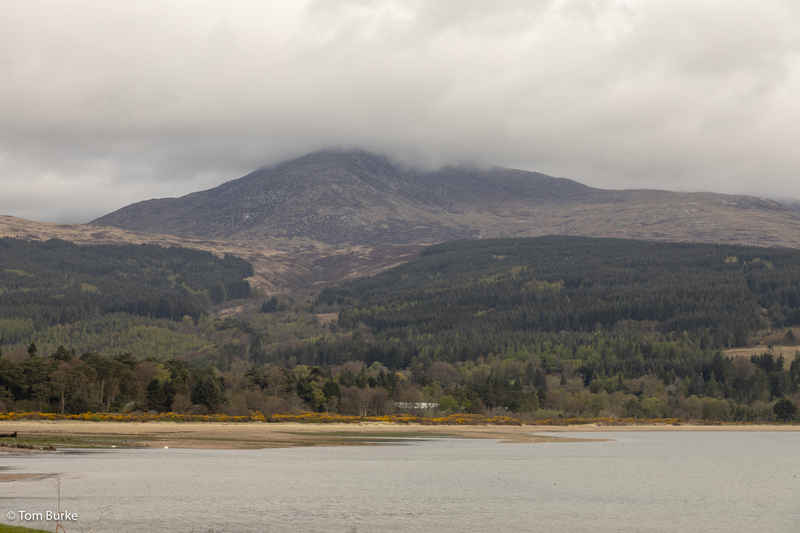 After that we drove round the southern end of the island and back up the eastern side, going through Whiting Bay and Lamlash before arriving at the Wineport near Brodick Castle for lunch. We had a couple of brief stops for ‘photo ops’ on the way, but by this time it was raining steadily. After lunch, and in view of the continuing heavy rain we did mainly indoors-y things. We visited some craft shops near the restaurant: a leather good store where Val and I each bought a new belt, and a ‘smellies’ shop – Arran Aromatics. There was also a small craft brewery, Arran Brewery, which other people in the groupl visited. Finally it was off to Lochranza at the northern end of the island for a visit to the Arran distillery. This is a new distillery, just 22 years old. Indeed, when it opened it was the first new distillery in Scotland for a very long time. It’s very small – the wash tun, the brewing vessels and both sets of stills (four in total, two used for each stage of a double-distillation) are all located in one room. Quite a contrast with the Glenfiddich distillery which we visited a year earlier! I can’t remember where this was taken! We were dropped at our lodgings at around 5:30. After resting for a while, having a cup of tea and cleaning ourselves up, we got very wet on the short walk round to the Douglas hotel. Still, we enjoyed our meal there, we sank a bottle of Chilean Merlot, and enjoyed a dram of Arran malt to finish. 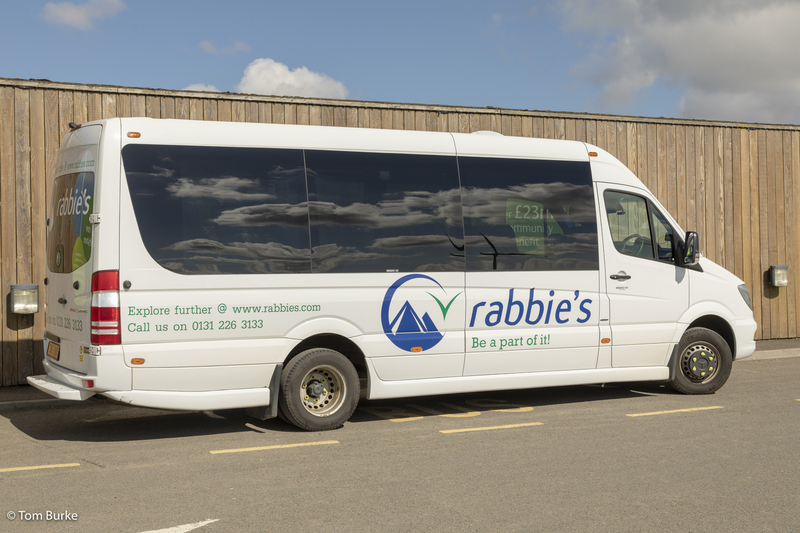 To Arran with Rabbies Tours! Actually, we’re already back. We went to Edinburgh on Sunday in late April for a first night, then joined the three-day, two-night Rabbies tour to Arran early the following morning. We finished the holiday off with another two nights in Edinburgh, returning home on Friday afternoon. Mostly the weather smiled on us (always a benefit in Scotland), the tour was great, and there’s always things to do in Edinburgh whatever the weather. The tour was a three-day, two-night affair. Starting in Edinburgh early on Monday we drove over to Glasgow for another pickup then south to the Ayrshire coast. The target at the end of the day would be Brodick, the main ferry port on Arran, but we visited other places along the way. After that we did the drive to Ardrossan where, at six o’clock, we boarded the CalMac ferry ‘Caledonian Isles’ for the 55 minute crossing to Brodick. We ate our evening meal on the ferry, as we had been advised that places to eat in Brodick might close pretty early in the evening. We were booked into a guest house (Hunter’s) in Brodick which was delightful. 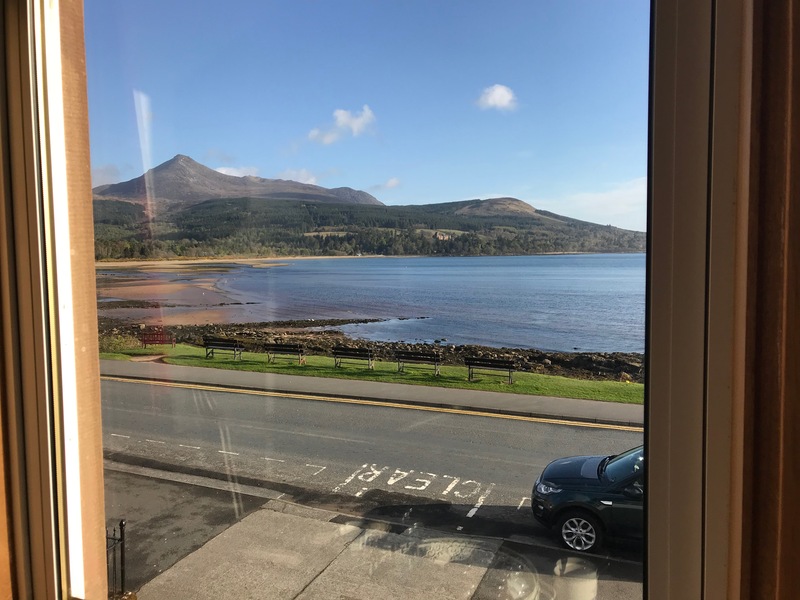 We met the proprietor, Caroline, who was very friendly and chatty, and who showed us to our large, comfortable room at the front of the house overlooking Brodick Bay . The weather that first day was delightful – sunny with blue skies – but not that warm as there was a chill wind blowing. 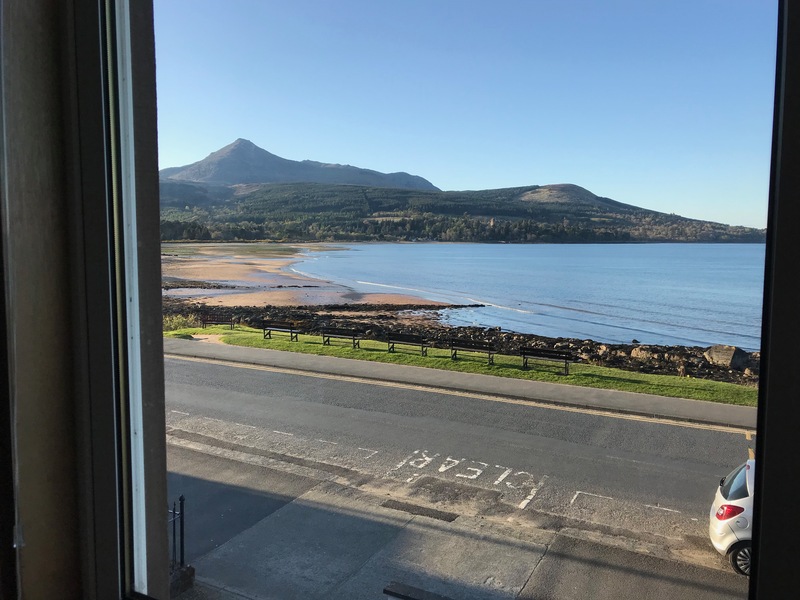 Still, the weather gave us excellent views of the Scottish landscape during the day, and the view from our room of the bay and Goat Fell, the highest mountain on Arran, was pretty special. We went out for a drink later at the Douglas hotel, just over a quarter of a mile away, which we discovered a) served food and b) seemed to be still doing so at 8:30 or so. A quick look at the menu revealed things we would enjoy so we decided that would be our dinner location for the following evening. Then it was back to the guest house to bed, for a fairly early start the next day.